After doing the laundry today and getting my two sheets of Zeros for cards, Hubby and I decided to treat ourselves to a bun. 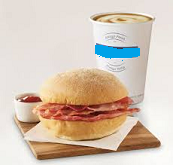 We were asked if we’d like a breakfast roll as it was gone 11 am and there were a few rashers of bacon left. Why not, we thought, so settled down to coffee and rolls. Naughty, but nice, and the bun came home. Overhearing a conversation about internet servers failing and computers bombing, Hubby was pleased to confirm that the server concerned was the same as ours and we had reported it. We had confirmation from the company that there had been problems in our town and the surrounding area which they were working on. The couple were relieved that it wasn’t them or their computer devices, and we spent the next quarter of an hour or so in good company. We’ve been home a while now, had dinner (and bun), walked the dog twice and settled down to our blogs. I have just got to the end of this morning’s entries in my reader amid frequent bombing and time outs. I have about 20 posts come in now, but think the challenges have all been met or at least put in WIP, so I can read the new ones at my leisure. 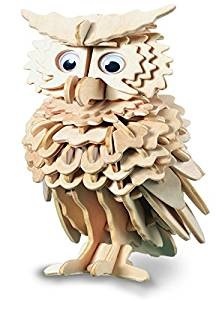 The owl is an enigma. Hubby is cursing for stopping yesterday as he can’t remember how far he’d got and what number series he was up to. The occasional feather piece drops off so he is glueing some pieces in now. With fading daylight, it’s proving more difficult to identify the slots and pieces to fit, so he will continue with it tomorrow. I shall probably be Zeroing in then. This entry was posted in blogging, current events, diary, hobbies and interests, My life and tagged hobbies, miscellaneous, puzzles. Bookmark the permalink. I think it’s the glue now! The coffee and other delicacies sound good. Mmmm! ha. That was brilliant sketch, one of their best. I guess i have no clue ah, what is zero you needed? Or is this cards you make? I have several special birthdays this year, 2 80s, 1 90, a 30 anniversary and had run out of sticky zeros though I still had plenty of numbers. I got a sheet of both gold and silver today so am now well set.